RME HDSPe MADI FX - marks a new milestone both in the history of audio interface cards in the past two decades and within the long series of outstanding RME devices. 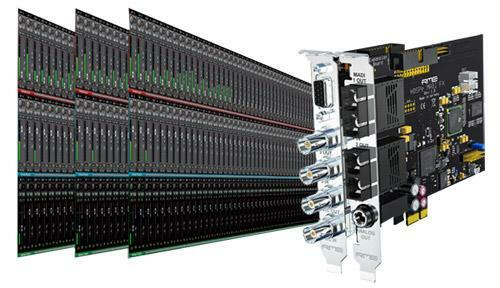 Never before has such a high-performance multi-channel audio system existed.The HDSPe MADI FX features 390 audio channels! Three MADI I/Os - two optical and one coaxial ? are accompanied by one AES/EBU I/O and one analog monitoring output. To complete the feature set, a Word Clock connection and four MIDI I/Os were added. The complete technology and connectivity are highly integrated into the smallest possible amount of space - typical for RME. Only one PCIe slot is required on the motherboard, plus one free slot opening on the case. To guarantee RME?s unique low latency performance with such a huge amount of audio channels, the HDPSe MADI FX introduces a newly developed modular Hammerfall Pro Audio Core. The high-tech core will process three times as many channels as the channel count of the previous MADI flagship, while actually reducing the system load and enabling ultra-low latencies down to 32 samples on modern computers. A sophisticated new efficiency technology will automatically deactivate currently unused channels, so that they require no processing power or bandwidth. A simple stereo playback will not require any more performance than from a standard stereo audio card - despite the use of a professional multi-channel system with almost 400 channels.The new core technology is accompanied by a special version of TotalMix FX, which allows using the enormous channel count in an efficient and practical manner. The addition of numerous performance optimizations ensures that the 4096-channel mixer of the MADI FX responds just as smoothly as its 1800-channel counterpart in the Fireface UFX. A new and faster DSP allows for a greater number of EQs and compressors. An innovative new layout of TotalMix enables ergonomic handling of the enormous number of channels. A special option makes it possible to visually hide unused channels. Complete "Hide setups" can be saved at any time, and switched with a simple mouse click, for example between the channel view of the drum mix and the full band setup.The 192 kHz RME effects engine allows latency-free monitoring with numerous effects like EQs, Compressors, Reverb, and Echo rendered directly on the hardware of the card, independent from the DAW software in use.The integrated TotalMix matrix conveniently allows the use of the card as powerful MADI router. Unlike most other router solutions, each channel can be routed individually - even with separate level settings for each routing. The unparalleled flexibility of TotalMix can turn the most exotic applications into practical reality. RME's unique Seamless Redundancy Operation uses the cards? 3 MADI receivers to provide professional users with state-of-the-art fail safe operation. In SRO mode the card operates as single MADI input device, recording up to 64 channels. As soon as the current input fails the audio data received from one of the other two inputs is used. The audio data is not interrupted when switching to another input ? and the card can use not only one, but two more sources for redundancy. No relocking and synchronization to a different clock source is required, and the interruption caused by the external failure is minimized to a few samples. Analog Monitoring Output: The HDSPe MADI FX provides an analog stereo output in reference quality with RME's proven low-latency converter technology. The output is ideally suited for high- and low-impedance headphones. AES/EBU I/O: An audio interface which is limited to MADI I/Os needs expensive multichannel converters to perform a conversion to other digital formats or even a simple sync connection. Those who work with MADI usually have also AES/EBU devices in use and would like to connect them easily to their DAW. Therefore the HDSPe MADI FX provides a digital I/O in the professional AES/EBU format. This allows the connection of a simple AD/DA converter (e. g. RME?s ADI-2 for example) to get a 2nd monitoring output, or to create a talkback setup. Even the connection of an external digital effects unit without a costly external MADI to AES/EBU interface can be realized easily.The AES/EBU I/O can also be used for synchronization, e. g. with Steinberg's synchronizer and clock device, the Nuendo Sync Station. RME MADI devices will not only transmit 64 audio channels with a single connection, but also regular MIDI signals. The HDSPe MADI FX is no exception: each MADI I/O owns a virtual MIDI I/O in the operating system that can be addressed by any MIDI program.MIDI signals will be transmitted invisibly through the same lines and distances as the MADI data. At the other end of the MADI cable, the MIDI signals can be played back from RME MADI devices via a standard MIDI DIN port. MIDI over MADI also allows remote control of all RME MADI devices, including monitoring and configuring a device's complete status. This outstanding feature makes MADI transmission across large distances practically usable, with host computers and devices far from each other - for example, FOH and stage.All units can be programmed with their own ID, allowing independent remote control of multiple devices via a single MIDI channel. RME provides a free Windows and Mac software to control all RME MADI devices. This "MIDI Remote? can use any existing MIDI port within the system to remotely control and monitor all connected devices. The software provides both a front-panel like operation and an extended Matrix display. Wordclock I/O: A word clock I/O with switchable termination completes the connectivity of the MADI FX card. While most MADI-based devices require an additional word clock or AES/EBU line, the MADI FX card uses SteadyClock to extract the reference clock directly from the MADI signal, while reducing possible jitter to a minimum, making long-distance connections even more convenient. The word clock input processes signals automatically in single, double or quad speed. TotalMix FX: The center piece of the new MADI PCI Express platform is TotalMix FX, the DSP-based hardware mixer with 46 bit internal resolution, comparable to high-end digital consoles in its complex functionality. Digital Zero Latency Effects: The HDSPe MADI FX provides the same 192 kHz effects engine as the Fireface UFX and UCX. To supply the sheer amount of nearly 400 channels with as much as possible high-quality effects, the DSP algorithm's efficiency was further improved and a more powerful FPGA of the latest generation was selected. These performance improvements ensure that the 4096-channel mixer reacts just as smoothly as those on other RME interfaces with significantly fewer channels.Every input and output channel comes with a luxury feature set, comparable to a full-scale digital console. The effects per channel include 3-band parametric EQ, adjustable Low Cut, Auto Level, Compressor, Expander, MS Processing and phase reversal. The Reverb and Echo effects unit is available for all channels by way of a stereo send and return bus. The HDSPe MADI FX easily surpasses the competition by offering all these effects even at 192 kHz operation. The Hide feature: To keep an overview of 390 channels in live and studio situations, where not all channels will need to be visible at all times, TotalMix FX provides a new form of channel management. Although the software has featured a sophisticated multi-window technique from the start, which can display several views of the mixer at the same time, channel rows of 196 channels need a special user interface design. For example, a mixdown of channels 1, 2, and 191/192 at the same time would need a constant scrolling back and forth, and these channels would be never visible within one view.All these and other limitations are eliminated with the new Hide technology. Any channel can be hidden from the surface. Hide setups can be stored and loaded anytime. An example: on channels 73-85 are all signals of a drum set, on channels 110-114 represent some electronically generated drum sounds. The Hide feature will enable the user to remove all the other channels from the view, and display just the entire drum mix with a simple mouse click. Channels 110-114 seamlessly connect to channel 85 - all in one window ? creating a perfect overview with optimal operation.Hide also allows removal of channels for a connected MIDI remote control. Remotes with few faders can thus control any individual selection of the existing 196 channels ? without the need of further switching. Flexible Routing with professional Matrix viewAll 194 inputs and 196 playback channels can be routed and mixed to 196 physical outputs completely freely. This impressive feature culminates in the most powerful router/mixer ever implemented on an audio card, and allows much more than a usage as pure computer I/O unit. Monitoring Controller: TotalMix provides a complete arsenal of all the functions needed to control the monitoring of modern in-the-box studio or live mixing sessions. Among these, there is Dim, source selection, monitor switching, integrated talkback, a flexible cue setup, mute and mute FX, mono, speaker B switching and much more. TotalMix Remote Control: The main functions of TotalMix can be remote controlled via MIDI with any Mackie Control compatible controller. Additionally TotalMix can be also remote controlled by Apple's iPad via Mackie Control emulator apps, standard MIDI commands, and OSC (TouchOSC, Lemur). This realizes a comfortable wireless remote control of TotalMix key parameters. SteadyClock: RME's unique jitter suppression technology guarantees perfect sound quality throughout, making the device completely independent from the quality of external clock signals. Due to the highly efficient jitter reduction, the DA converter operates independently from the quality of the external clock signal, as if they are working with internal clock all the time. Moreover, a clean signal with minimal jitter is available on all digital outputs. ICC: Intelligent Clock Control (ICC) not only displays every clock status, but will also retain the last valid input sample rate in case of failure of the external source. Other renowned RME technologies like SyncCheck offer a quick detection of clock problems. DIGICheck: The card comes with RME's unique software tool box for metering, testing, measuring and analyzing digital audio streams. On Mac OS X provides unique functions and features of the spectral analysis of the data calculated in hardware level right through to sophisticated multi-channel level meter. On Windows, an additional multi-track recorder and the display of playback data from an audio software are also available.